Coms PLC has today launched the Camrivox , a home telephone adapter that gives consumers a free second landline and enables low cost calling over the internet. The adapter enables people to turn their normal home phone into an internet phone at the push of a button. Camrivox adopters will need an existing broadband connection, but will be able to make competitively priced calls using the internet without the need for a specially tailored handset or to sit at a computer. It costs £35 to buy, which is about the same as BT line rental for three months. This second line, which comes with its own telephone number, enables consumers to dial out over the internet, even if someone else is already talking on the home phone number. 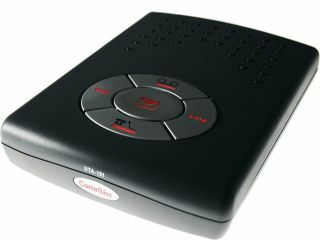 The Camrivox can then handle both calls at the same time. Coms PLC says that users can make significant savings on the cost of making calls from a standard landline, because the calls are routed through the internet rather than the telephone system. "Making calls over the internet is starting to take UK homes by storm because it offers some of the cheapest call rates around, often up to 80 percent cheaper," said spokesperson Nina Howse.